I stood on the deck, looking over the railing at stars around us. I had flown through space before, but never with so little between me and the vacuum. It was incredible, albeit a bit harrowing. I looked over to see Jessie standing further down the deck. I walked over to her and leaned against the railing. “Beautiful site, isn’t it?” I asked. “Mmmhmm,” Jessie responded, looking off distantly into the stars. She sighed and turned to face me. “I miss Reno, and I don’t really know anyone on this ship, besides you, of course.” Reno was Jessie’s husband, and last I knew, he had been working as an undercover agent. “How is Reno?” I asked. “I hope so,” she said, turning back to look at the stars as they zoomed past us. “I definitely agree,” Serena’s voice said from behind us. After a few minutes, the ship landed safely at the docking bay. Serena, Tawmis, Jessie, Blackthorne, Say, and I all disembarked to meet with the Space Pope. Brad and Estir remained behind, as the Space Pope had only authorized the six of us. MrKidd-02, the Space Pope’s android, met us at the docking bay. “This way, if you please,” he said. We were ushered out of the docking bay into the main corridors of the Space Pope’s headquarters. We took an elevator to the top floor, where the doors opened to reveal a magnificent office suite that overlooked the busy city. Airships and speeders flew by at lightning fast speeds outside of the window, as the technological boom of Andromeda made itself clearly known. Coming from a much less populated world, it was quite breathtaking for me to see. “Is that why you wanted us to land here directly and not the main spaceport?” Serena asked. “Have there been any direct threats?” Say asked. “Not yet,” the Space Pope replied. “But we’ve taken full precautions. I had the grand musician, Mr. Allen, brought here full time to be kept safe in case anyone tried to abduct him as well. The great warrior, the Decaffeinated Jedi has been brought in to keep him and everyone here safe. No one can get through his watchful eyes unless it’s absolutely necessary.” As he said this, the Decaffeinated Jedi entered and placed a pad on the Space Pope’s desk. He nodded politely to us before he left to continue his patrol. I felt much safer knowing that he was here. He was one of the finest warriors on Andromeda, and quite possibly the entire galaxy. “I’m afraid not,” the Sapce Pope responded. “The Two Guys’ android, PCJ-1, was turned off at the time, and he’s not been able to find anything else either to help. He will help guide you around their office and apartment, if you wish to begin your investigation. “Has production on SpaceVenture ground to a halt?” Blackthorne asked. 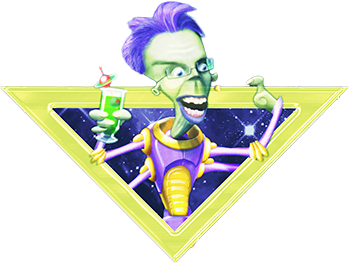 The first person to come forward was four-armed, green-skinned bespectacled alien with blue hair and a rather large mouth. He carried an alcoholic drink is his upper right hand. “I’m sure most of you know the Space Quest Historian,” the Space Pope said. I had known the Historian for some time, and I was grateful to have him on the team with us. His knowledge of Space Quest, as well as the Two Guys, would be a helpful advantage. “Bill!” I cried out, excited to see my dear friend Bill Grig amongst the Andromedans, in his typical blue beanie visor hiding most of his eyes, along with his characteristic mustache as well. Bill was one of my closest friends, and I was excited to see that he would be joining us. “Sorry, I just didn’t see him at first,” I said sheepishly, feeling somewhat foolish for my outburst. He walked us over to a group of computers with several people around it. “And then, of course, we have one of the Gentlemen of Rock, Musically Inspired,” the Space Pope indicated the young man who came next in line. Musically Inspired pressed a button on his wristband, and seemingly from all around us, the fantastic metal medley, “A Greatly Exaggerated Tale of Adventure” played. “And last is one of our many talented artists, and a woman of few words, Akril.” As the Space Pope introduced her, the young woman who I just noticed had been writing on a pad that she was holding held up a picture of the Two Guys, with the words “I will do whatever I can to help you find them!” written on it. “They’ll be in contact with you through the Historian, and if there’s anything that we can do here on Andromeda to help you out, they’ll organize it,” the Space Pope said. He turned towards Serena. “I’ll leave this in your more than capable hands. If you’ll excuse me, I need to try to try to keep things here as stable as possible, even if work is scarce. If you need anything, PCJ-1 can assist you.” The Space Pope pushed a button on his desk, and the Two Guys’ android, PCJ-1, walked into the room. “Of course,” Serena said. “Thank you for your time. We’ll do whatever we can!” There was a resounding noise of affirmations from our group in response. “I know you will,” the Space Pope responded. “Good luck!” He sat back in his desk and began reviewing the data pad that the Decaffeinated Jedi brought him. Serena introduced the people in our group who weren’t already familiar with the Historian and Bill. After everyone briefly connected, she motioned for PCJ-1 to come over. “PCJ, can you take us to the Two Guys’ rooms and their office?” she asked. “Most certainly,” the android responded. “Arrr…It’d be me pleasure.” Tawmis responded.